Although nine other automakers have vowed to integrate Siri Eyes Free technology into their 2013 vehicles, Chevrolet has become the first car brand to fulfill its promise by installing the new feature on the 2013 Chevrolet Sonic and Spark. 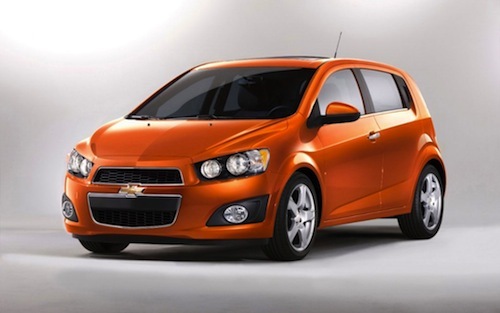 On Wednesday, the 2013 Chevrolet Sonic and Spark became the first vehicles to be equipped with Siri Eyes Free technology. Chevrolet initially announced that it would be outfitting the Sonic and Spark with the Eyes Free feature late last year. Other than Chevrolet, BMW, General Motors, Mercedes-Benz, Land Rover, Jaguar, Audi, Toyota, Chrysler, and Honda have also pledged to support the new technology. "The Chevy Sonic and Spark are the first vehicles to offer Siri Eyes Free integration," said Cristi Landy, Chevrolet marketing director for small cars. “Safe, easy, reliable and portable connectivity is a top priority for our customers, and Siri complements MyLink's existing capabilities to help deliver an incredible driving experience." The Siri integration is made possible by Chevrolet’s MyLink infotainment system, which allows drivers to control online services through apps like Pandora and Stitcher via voice commands or the touch-screen. In order to employ the Siri Eyes Free feature, users must have a compatible iPhone running iOS 6. Using a compatible iPhone and MyLink enables drivers to make voice-activated, hands-free calls to iPhone contacts, listen to and compose texts and iMessages, access calendar features and play songs from their iTunes library. As if that weren’t convenient enough, Chevrolet Spark and Sonic owners can also utilize a steering wheel-mounted button to access Siri without having to take their eyes off the road or hands off the wheel. Furthermore, driver distraction is decreased by the fact that the user’s iPhone screen will not light up even when Siri is being used. Just because the latest batch of 2013 Sonic and Spark vehicles tout Siri Eyes Free technology does not mean that current owners will be left in the dark. Beginning in March, current 2013 Chevrolet Sonic and Spark owners can upgrade existing MyLink radios for Siri compatibility. Aside from Siri, the 2013 Chevrolet Spark and Sonic also come with numerous tech features including six months of OnStar’s premium Directions and Connections service, which includes Automatic Crash Response, Stolen Vehicle Assistance, Vehicle Diagnostics and Roadside Assistance. In January, Honda announced that it would install Siri Eyes Free technology into its 2013 Honda Accord and Acura RDX and ILX model later this year. Like Chevrolet, Honda owners will be able to direct Siri though a compatible iPhone running iOS 6. Launched in 2011, Siri is an intelligent personal assistant and knowledge navigation system. Working in conjunction with Apple’s iOS, Siri uses a natural language user interface to make recommendations; answer questions, and performs actions by delegating requests to Web services. Additionally, the software adapts to the user’s individual preferences over time.